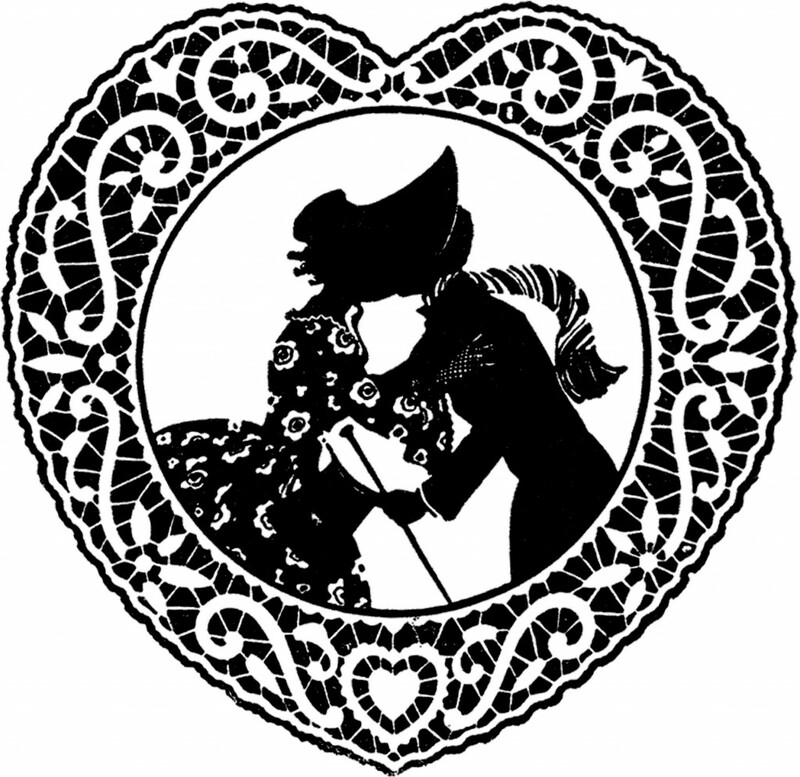 Today we have a charming collection of 12 Vintage Valentine Silhouettes! These images are just fabulously intricate Heart images and Valentine designs for you. We have 3 adorable cupid Valentines with their tiny bows. 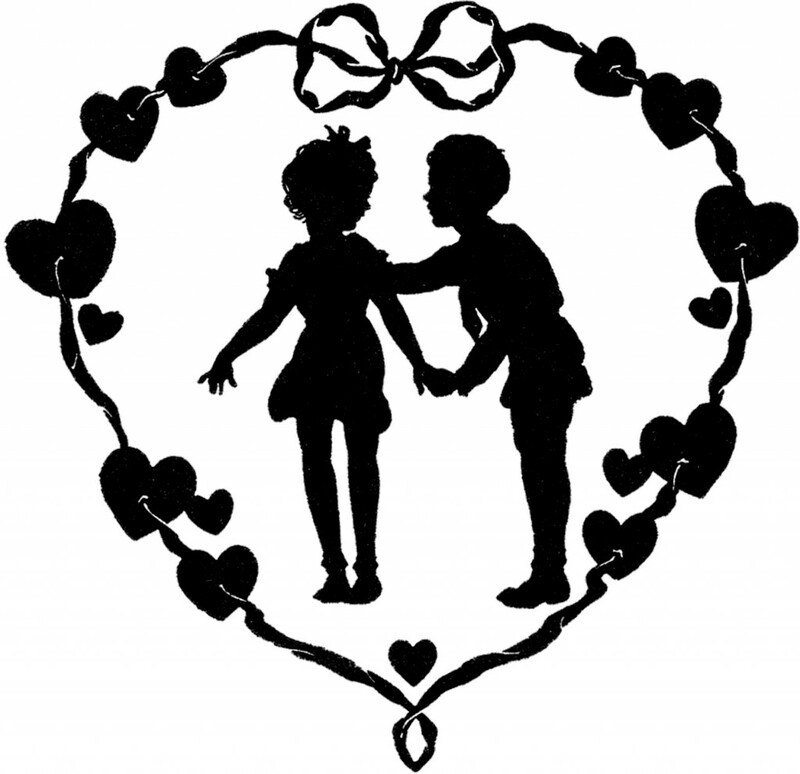 Then we have 6 delightful heart Valentine silhouettes that feature romantic couples. We wrap up the collection with 3 fun silhouettes . Two of these have red parts which makes them very unusual silhouettes. All of the images are nice for your hand made Card or your Valentine’s Day Craft Projects! I think they would make cute gift tags or maybe even a cupcake topper. The first of our fabulous Valentine Silhouettes is from an 1880’s Poetry Magazine from my collection! 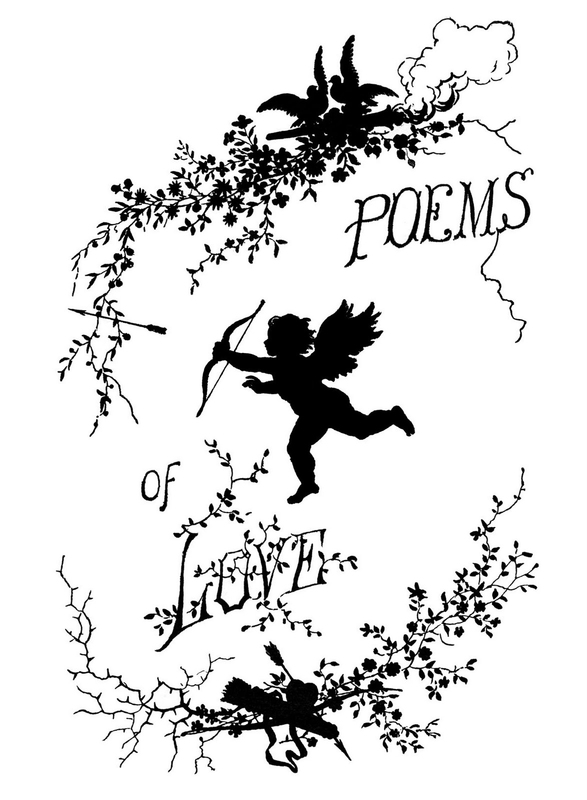 This was the title page called Poems of Love. I just adore the wonderful Cupid with some amazing Typography, Birds, and Foliage. I have also split out the Cupid from the first image, to give you more options for your Craft Projects! 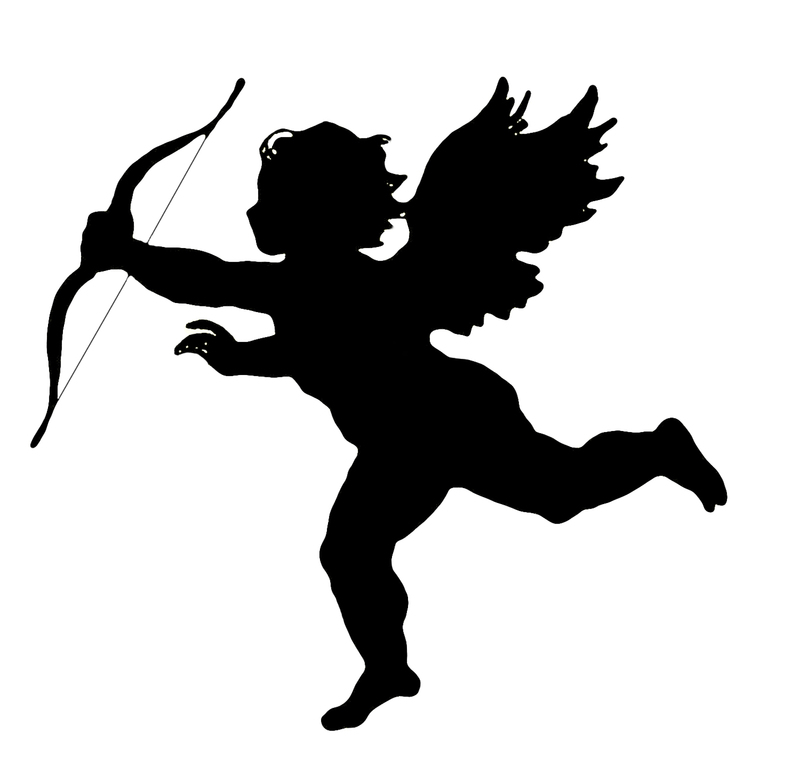 This is a Cute Valentine Cupid Image! 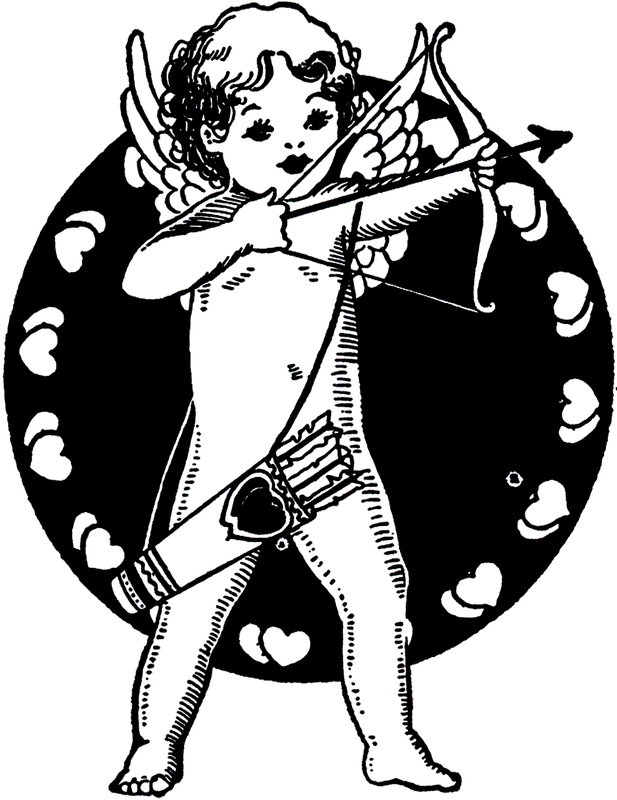 This adorable Valentine Graphic shows a Cupid with his Bow and Arrows! This one was scanned from a vintage book in my collection, a rare Circa 1941/1942 Printer’s Catalog. Nice for your hand made Card or Valentine’s Day Craft Project! This is a pretty Lace Valentine Silhouette! The Silhouette shows a charming Couple framed by a beautiful Lacey Heart! This one was scanned from an old Circa 1941 Printer’s Catalog. The Catalog does not appear to have ever been copyrighted, as there is no copyright mark on it. Above is a lovely Vintage Valentine Silhouette Freebie! This adorable Valentine shows Silhouettes of Children, a Boy and a Girl. They are playing or dancing with some ribbon. I love the Lacey Frame around the Heart! This one was also scanned from a rare Circa 1941/1942 Printer’s Catalog. 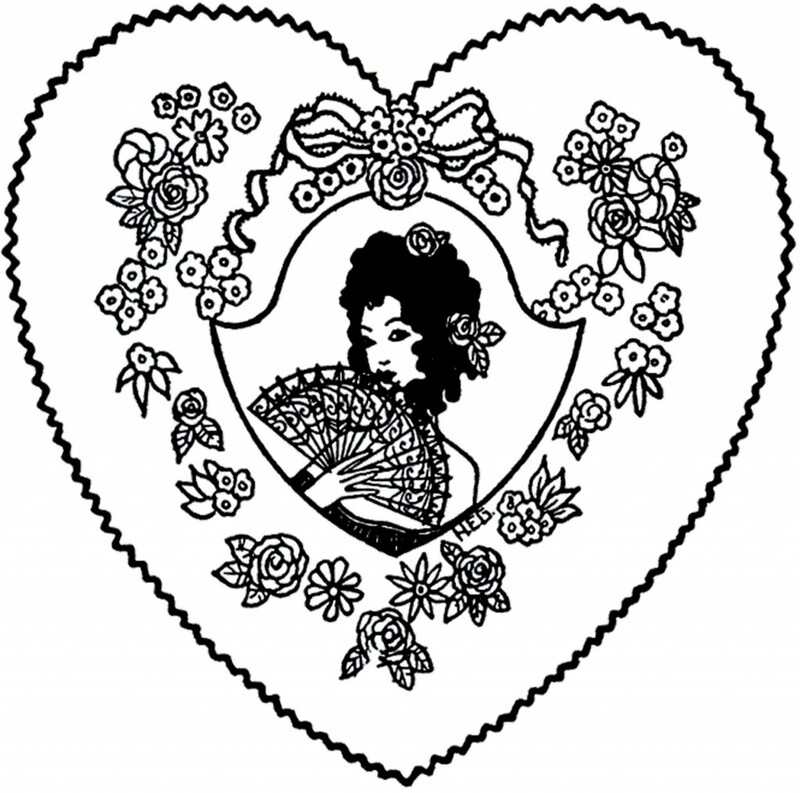 This is a lovely Vintage Fan Lady Valentine Image! This cute Valentine shows a Lady, with a Fan, inside of a Heart that’s decorated with flowers and ribbons. This one was scanned from the same Printer’s Catalog, as the one above. This is a lovely Vintage Doily Valentine Image! The Valentine shows a cute young couple sneaking a little Kiss, with her Bonnet used to hide it! I love the pretty Doily frame around this one! This another one that was scanned from the old Circa 1941 Printer’s Catalog. 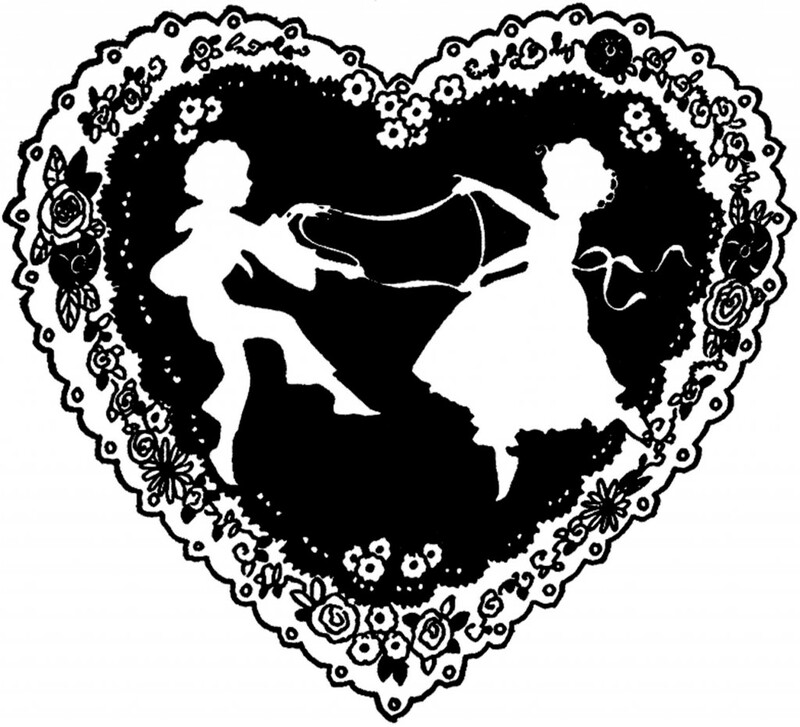 This is a darling Vintage Valentine Silhouette Image! 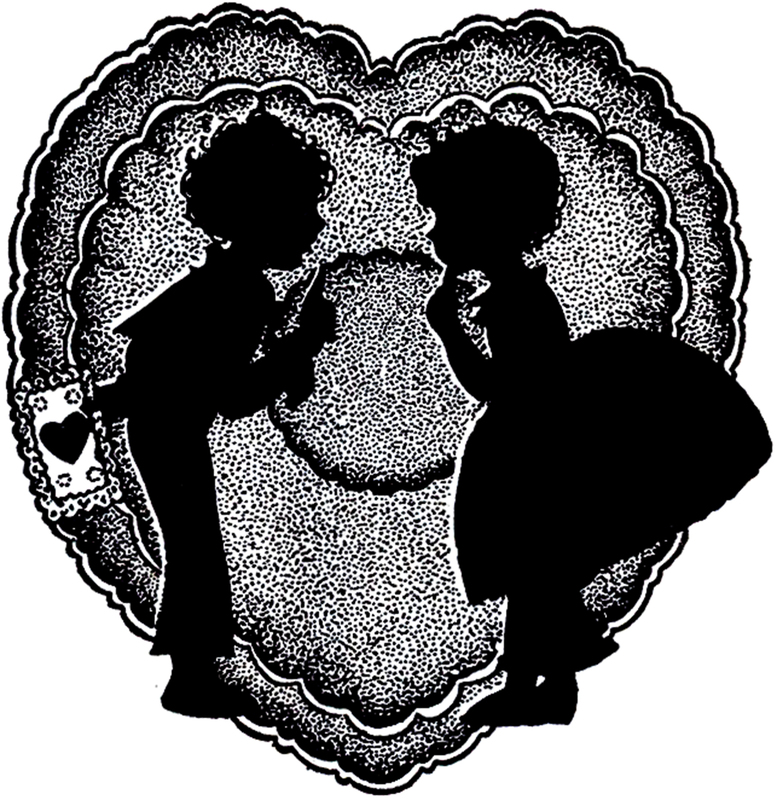 The Silhouette shows two cute children, a boy and a girl, holding hands. It looks like the boy wants a little kiss! I love the pretty frame around this one too! This is another one from the old Circa 1941 Printer’s Catalog. This is a Cute Boy and Girl Valentine Image! This adorable Valentine Graphic shows a Silhouette of a Boy and Girl framed up with a textured Heart! Yet another from the Circa 1941/1942 Printer’s Catalog. Nice for your hand made Card or Valentine’s Day Craft Project!. This is a darling Valentine Mail Silhouette Image! 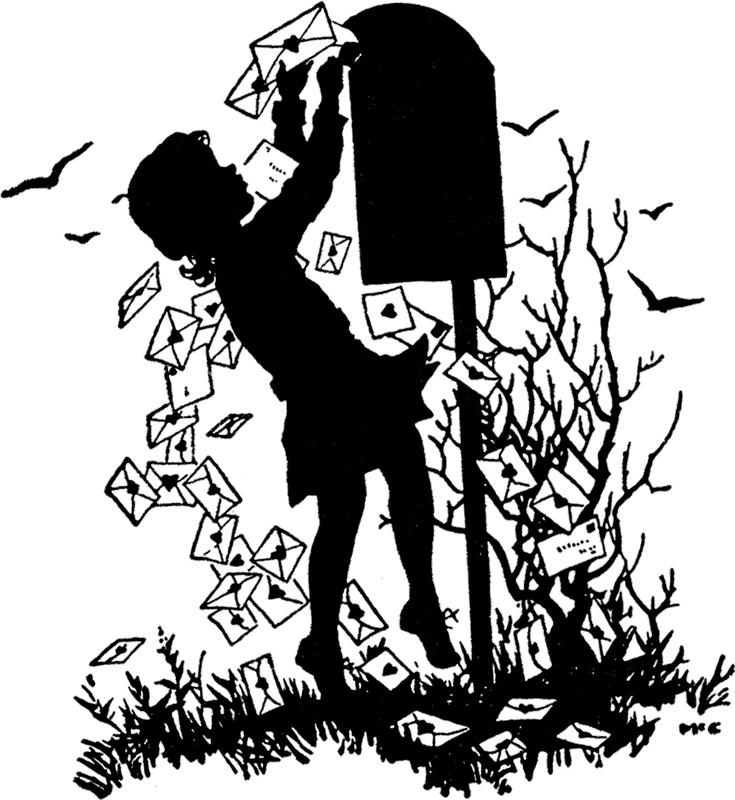 The Silhouette shows a little Girl mailing out her Valentines at the Mail Box! This one was also scanned from that same Printers Catalog. We close our Vintage Valentine Silhouettes collection with two unusual Valentine silhouettes with red accents. 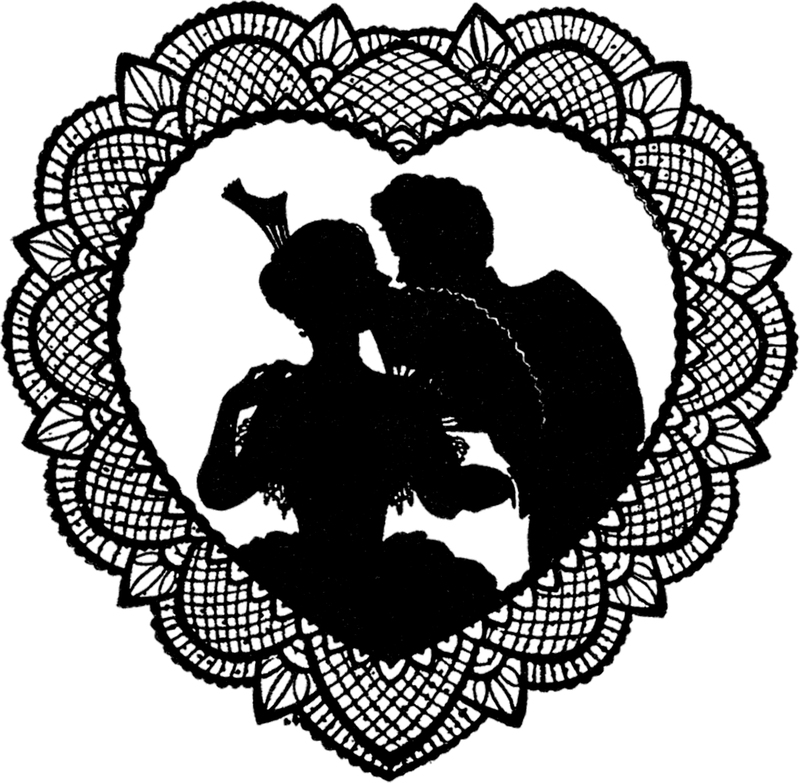 This is a lovely old Valentine’s Day silhouette from an old antique card. It features a romantic young couple behind a huge red heart. I just love that it has red in the silhouette. So unusual. 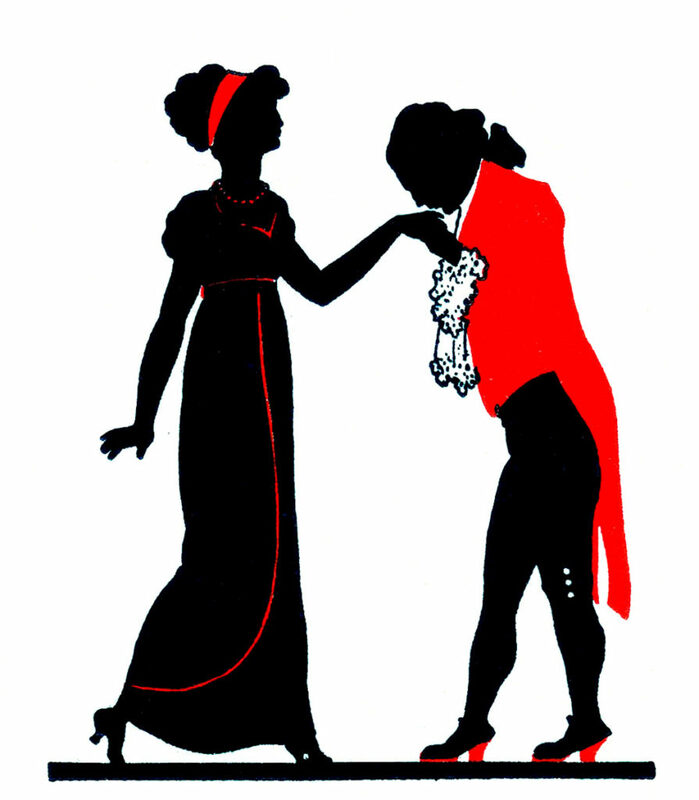 Our final Vintage Valentine Silhouette shows a romantic couple dressed to the nines. What a fancy man above with his red high heeled shoes and morning coat!! He is kissing the hand of a beautiful young lady. Don’t you love her red headband? 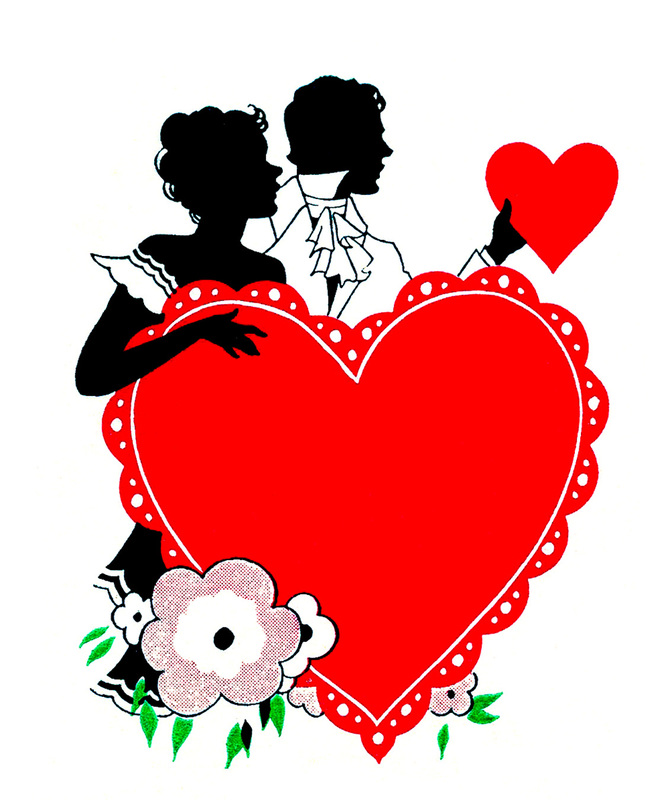 I hope you enjoyed this curated collection of 12 vintage Valentine Silhouettes Images. You might also like our 40 Free Valentines Images HERE! 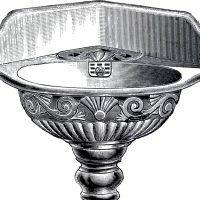 « How to Antique Glass: Aging Technique! These are so cute! Thank you for all the word you do in finding these old vintage clips. Im going to have to learn to be a crafty person so I can use these beautiful pieces of art work. These are beautiful! I’m always amazed at the quality and frequency of your posts. There are so many graphics I want to eventually use! 🙂 Thanks Karen! felíz san valentín!! yo tengo programado mi post para mañana, te espero en mi blog!! see you tomorrow in my blog!! You have turned me into a collector of all things vintage. <3 Thank you. love these . thanks so much for sharing.